Just 16 years after their own “Trail of Tears,” the Choctaw Indians raised money for Irish Famine relief. Visiting New York in 1989, Don Mullan, Director of Action From Ireland (AFrI), a Dublin-based human rights organization, was addressing members of the American Irish Political Education Committee about AFrI’s “Great Famine Project.” The Project had begun in 1988 as AFrI leadership reflected on the historical neglect of Ireland’s Great Famine, when over one million souls were consigned to unmarked mass graves. The Project was conceived to honor their memory by linking their suffering with the poor throughout the world today. AFrI proposed to initiate an annual ten-mile-long Great “Famine” Walk from Doolough to Louisburgh (Co. Mayo), to commemorate the 600 Irish men, women and children who perished in a 24-hour period as they traveled across the Mayo Mountains in harsh weather in a desperate search for food. After Mr. Mullan completed his presentation at the meeting, a young man approached him and asked whether he knew that the Choctaw, a North American èèIn during the famine of 1845-49. In 1990, on a trip to the U.S., Mr. Mullan traveled to Skullyville, Oklahoma to visit the old Choctaw cemetery where those who contributed to Irish famine relief were buried. He met with Choctaw Chief Hollis Roberts and invited him to lead AFrI’s third annual Great “Famine” Walk in Doolough in May, 1990. The forcible removal of the Choctaw is euphemistically known as the “Trail of Tears.” It was in fact a 500-mile genocidal death march from Choctaw ancestral lands in Mississippi to Oklahoma. The Choctaws were forced to make that journey in 1831 as a result of the U.S. Government policy of Indian removal during the Presidency of Andrew Jackson (himself a son of Irish immigrants). The “Five Civilized Tribes” inhabiting the Southeastern U.S. (Choctaw, Chickasaw, Cherokee, Creek, Seminole) were forced to move to the Oklahoma Territory, under pressure from white settlers who had encroached on their lands in violation of existing treaties. The Choctaw were the first to depart. Unprepared for the hardships of the journey, begun in December (one of the worst winters the South had seen), more than half the Choctaw population died of starvation, exposure and disease (cholera epidemics, smallpox and dysentery). Their tribulations were compounded by unscrupulous government contractors and soldiers who accompanied them and sold them rancid food and liquor at extortionate prices. The final insult was that the U.S. Government made the Choctaw pay for their removal expenses. 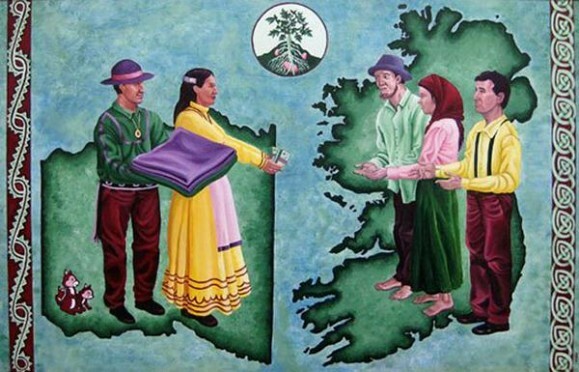 In 1847, only 16 years after the beginning of Choctaw Removal in 1831 (a process which lasted through 1849), the Choctaw learned of the plight of the Irish people 4,000 miles away. The Arkansas Intelligencer and Niles Weekly Register (which syndicated the article from the Intelligencer) recorded a meeting in Skullyville (capital of the Choctaw Nation in the Oklahoma Territory) where a collection was taken to assist the victims of the Potato Famine in Ireland. Though a discrepancy in the amount collected exists (some historical accounts state $710 while the figure Mr. Mullan deciphered from poor quality Intelligencer microfilm is $170), money was raised in a remote Oklahoma town by Indians for Irish famine relief. The only other 19th century reference chronicling the Choctaw act of generosity to the starving Irish is found in The Voyage of the Naparima, based on the diary of an Irish schoolteacher from County Sligo. Gerald Keegan, with his fiancee, fled the Famine in 1847. They took passage on the Naparima, one of the many dilapidated hulls transporting Irish to Canada and the United States on the Irish “Trail of Tears.” Keegan’s March 13, 1847 entry recounts how people in “the outside world” had responded to the tragedy of mass starvation in Ireland. He reported that the Sultan of Turkey, the working people of England, the Czar of Russia, the Emperor of China, local potentates in Egypt and India and the Jewish people of New York City sent contributions to relieve the suffering. Both the Choctaws and the Irish (through AFrI), did just that. The experience of the Doolough March and the modern-era solidarity spawned by the recognition of a shared experience in tragedy prompted them into a positive response to a then-current famine catastrophe. In September 1992, the Choctaws and AFrI joined in a re-enactment of the Choctaw “Trail of Tears” from Oklahoma back to Mississippi to raise funds for victims of Somalia’s “Great Famine.” Choctaw artist Gary White Deer, who designed the commemorative T-shirt for the occasion, wrote “My mother is part Irish and it will be a great and wonderful thing if we reaffirm the bond between our two peoples by helping to feed the People of Somalia. We will be feeding our own spirits as well. … Our shared histories keep telling us this.”èè..TX.-The Choc Facts-Friendships Cookbook, which listed 200 Choctaw and Irish recipes. The book also provides historical facts about the Trail of Tears and the Potato Famine, and an account of how the destiny of two peoples had become intertwined. This article originally appeared in the October 1995 issue of Irish America. Notably, the Great Famine Walk from Doolough to Louisburgh continues to this day. For over a century before Oklahoma was opened to homesteaders, members of the McCurtain family had served as Chiefs of the CHOCTAW tribe. The last on of these was Greenwood McCurtain, and it is from him that McCurtain Counry, Oklahoma, gets its name. I have had the pleasure of visiting a McCurtain family in CA who lost a son in Vietnam. What a beautiful story I have to admit it is the first time I ever heard this what an amazing act of kindness from people who had so little.